To construct an eight storey eye-catching office development close to Leeds City Centre. This major business development has been designed to provide headquarter office buildings which accommodate a variety of requirements designed to the highest standards. The build combines natural light and contemporary architecture to create a striking working environment. 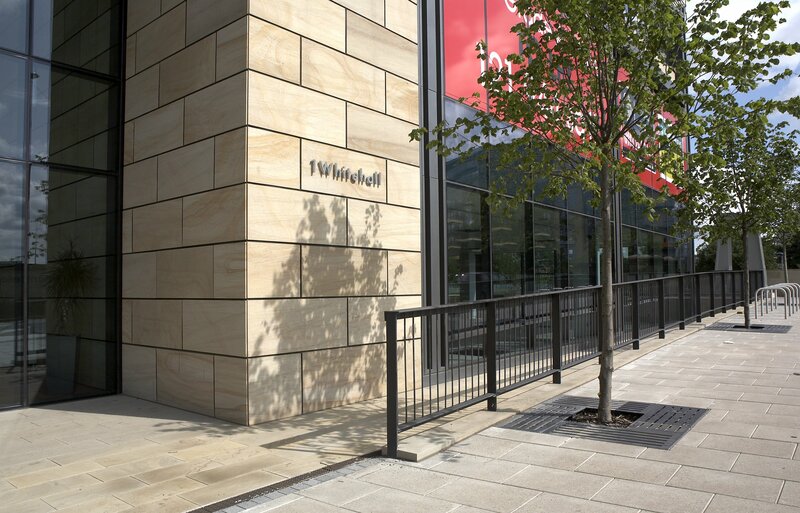 Marshalls supplied Fletcher Bank Sandstone ashlar walling for the exterior facade of the building giving a high quality finish to the overall design. The stone was fixed off site into a specifically designed window frame system before being installed in sections directly onto the external elevation. A Permian sandstone from the Locharbriggs Quarry. A new red sandstone with technical properties ideal for rainscreen cladding, ashlar and masonry products.